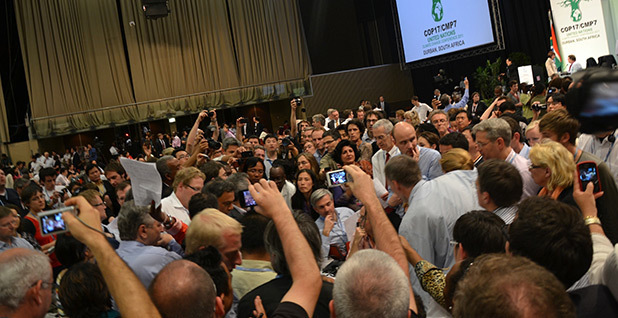 The 2011 "huddle to save the planet" that led to the upcoming Paris climate accord. Photo courtesy of Susan Bastress. Greater Expectations: The New Geopolitics of Climate Change exposes the on-the-ground reality of developing countries challenged by a world that will require every nation to cut carbon emissions. Stand up he did, arguing that night that all countries have a responsibility to keep global temperatures at safe levels, and no one -- even historically low emitters -- should have a right to unchecked development. "While they develop, we die. And why should we accept this?" he asked a packed plenary hall of surprised diplomats. Hood's intervention was the climax of a long-standing fight over whether developing nations should play a stronger hand in abating the greenhouse gas emissions that scientists say are warming the planet. As it set in motion a new international accord that could be completed in Paris in December, it also underscored a rupture that has only deepened within the Group of 77 and China, nominally representing the interests of all developing nations. When leaders from 194 countries meet in Paris, they will find a starkly different landscape than the one under which the 1997 Kyoto Protocol was crafted, or even the messy and incomplete Copenhagen Accord of 2009. In interviews with dozens of ministers, negotiators and longtime U.N. Framework Convention on Climate Change (UNFCCC) observers over the past year, most agreed that the once neatly divided world of rich and poor countries is gone. In its place is a more complicated and dynamic system in which countries of all levels of wealth and development are figuring out not whether to shoulder responsibility but at what level and how to finance the transition to clean power. "Yes, there used to be the poor guys and the rich guys, the polluters and the guys that are feeling the impact. That kind of division of blame and labor," said Marshall Islands Foreign Minister Tony de Brum. But, he said, "It's not us and the big guys anymore. It's everybody together." So far, 138 countries, including the members of the European Union, have come forward with plans to cut or ratchet down their emissions, and there will likely be a few more that will be wrapped into a final document to be signed in Paris. That, de Brum and others said, would have been unthinkable just a few years ago. The list includes not just big players like the United States and China, but also war-torn countries like Rwanda, tiny islands like Tuvalu and poverty-stricken nations like Bangladesh. "This framing that it's rich versus poor makes it sound like it's only the rich countries who have to act, who have to pay, or who are acting and paying. It's a much more complex picture than that," said Jennifer Morgan, global director of the World Resources Institute's climate program. Under the radar are the countries in the middle -- those who are not yet making an emissions splash, but whose rapid economic and carbon growth guarantees they will be among the major climate players of the future. They include countries like Turkey, which is putting coal-fired power plants online just as fast as neighboring Europe can shut them down; Mexico, where an ambitious plan to peak emissions may be hampered by a newly liberalized energy market; and Singapore, which boasts the world's third-largest per-capita gross domestic product but remains reluctant to put its wealth at jeopardy in order to tackle domestic emissions. 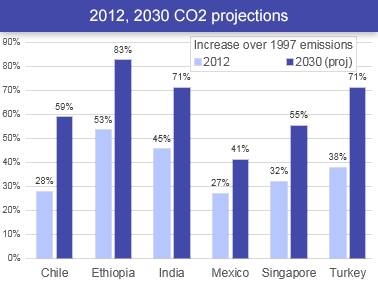 By 2030, developing countries’ emissions will exceed those of industrialized countries by 77 percent. Here’s what that growth will look like in six key countries. Data courtesy of the Climate Action Tracker. It's countries like Chile, which is seeking a major expansion of its renewable energy capacity even as it struggles with an aging and inefficient transmission infrastructure. Or Ethiopia, which has grand designs to be a middle-income country by 2025 while remaining carbon neutral but is still grappling with more than 25 million people in poverty. Whether those countries as well as major players like India -- still wed to coal despite renewable energy ambitions -- can meet their targets and continue decarbonizing will be the real determinant of whether Paris is a success. Over the next seven days, ClimateWire will examine the very different positions those countries have taken in the U.N. climate negotiations and how their international strategies have affected their domestic efforts on climate change. We will also look beyond Paris to the on-the-ground realities of the political and structural challenges they face. "The UNFCCC process has been a proxy for a difficult discussion of trying to move countries away from the old North-South paradigm and into a paradigm of mutual dependency," said Connie Hedegaard, the former European commissioner for climate change who helped lead the charge for a new global agreement in Paris. "If you look at it through a human development lens, you will see the world is not organized along old categories. It's much more complex," she said. The shifts in alliances in the U.N. negotiations came slowly at first, and then seemingly all at once. The Kyoto Protocol divided the world into categories, or annexes. Annex I, 15 rich nations and European Union, would be charged with mandatory obligations to cut emissions. Hundreds of others, non-Annex I countries, could act voluntarily but were not obligated. Developing countries were allied in their insistence that wealthy countries, which had spewed carbon dioxide into the atmosphere for a century, should clean up the global mess they alone made. By Copenhagen, that architecture was already straining at the seams. The United States never ratified Kyoto because of it, and while environmental groups pilloried the Bush administration for that decision, when President Obama came into office they were no more willing than their predecessors to get into another deal that treated America differently from China. But longtime observers said it wasn't just the relentless assault on the system from the United States, Japan and Europe that caused its fissures. Emissions from developing countries zoomed -- with China's alone growing 80 percent between 1990 and 2007, according to the International Energy Agency, displacing America as the world's largest climate polluter. Meanwhile, the impacts on vulnerable nations were becoming real. Island leaders, who had for years been pressing quietly within their caucus for more action from everyone, started to get publicly vocal. "The differences have become starker," said Jake Schmidt, international program director at the Natural Resources Defense Council. "There is a clear sense among many developing countries that the 'just say no' position doesn't serve their interests anymore. That it was fine 15 years ago to say the West has to act on this problem because it's all their fault, but the math doesn't work that way anymore. These lines have been blurred without anybody admitting it." Others said the shifts also happened because developing countries were forced to face the reality that industrialized countries were no longer willing to move forward alone. "It's becoming less and less a confrontation between rich and poor and that I think is partly for a disappointing reason," said Yvo de Boer, the United Nations' former climate chief and now head of the Global Green Growth Institute in South Korea. "Developing countries are beginning to realize that this process is highly unlikely to provide them what they need to green their economies and cope with the impacts of climate change," he said. "They're realizing they are on their own." De Boer noted that the G-77, led by China, has been instrumental in keeping developing countries unified and bolstering their influence in U.N. arenas. But, he acknowledged, when it comes to climate negotiations, keeping together an alliance with countries as diverse as Saudi Arabia, "for whom every drop of oil not sold has an impact on the economy," to Kiribati, where every ton of emissions into the atmosphere is a death knell, hasn't been easy. 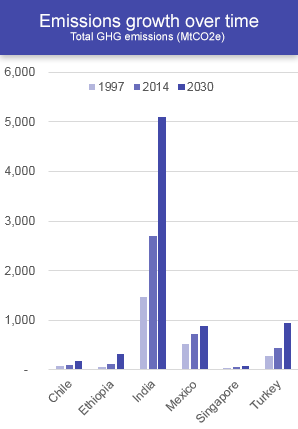 While India’s emissions have spiked most dramatically since 1997, other major developing countries have also seen major increases in their climate output in the last two decades. Data courtesy of the Climate Action Tracker. "Finding a compromise in such a large group is very, very difficult. For a long time, it was worth it because the G-77 were not only standing shoulder to shoulder in the climate debate, but in every other U.N. forum, as well," he said. "If you stick with the group on the negotiations of fried eggs, they will stand with you on the negotiations over boiled eggs." But by the time a 2009 summit in Copenhagen, Denmark, dissolved into chaos with a group of hard-line nations led by Bolivia, Venezuela and Sudan blocking the formal adoption of a deal, some countries understood there must be change. Costa Rica, Ethiopia, Switzerland and more than two dozen other countries that saw themselves as "constructive" players formed a coalition called the Cartagena Dialogue. Out of that, a group of Latin American nations that also included Chile, Peru and Colombia started making the case within the G-77 that developing countries should take mandatory cuts. The major emerging nations of Brazil, India, South Africa and China strengthened their alliance, and oil-producing countries like Saudi Arabia and Venezuela joined forces with China and India to beat back progressive efforts. Each formed new formal blocs within the G-77, pulling the body in multiple directions at once. "This is a really interesting process in which the former bloc in which the economies used to be organized, now in the climate debate is completely different," said Peruvian Environment Minister Manuel Pulgar-Vidal. Will the resulting strategies be ambitious enough? "For those of us who work in the real world, it's not about ideological point-scoring. It's about getting the politics right and the pricing right," said Malini Mehra, chief executive of the Global Legislators Organization for a Balanced Environment. "The bloc system has been broken asunder. That's where the new story is. It's very multi-polar, and that's why it's so exciting," she said. The new alliances are having real-world implications. When countries meet in Paris, the discussion of how to divide responsibility for fighting climate change will still be simmering, but it will be starkly different from the one diplomats had in 1997. Poor countries say they must see finance, including a promised $100 billion annually by 2020, to help their efforts. But only a few are still tying those dollars to the idea of reparations for the rich world's historical emissions. India is perhaps the most powerful country still in that camp. "Historical responsibility cannot be wished away by any new parameters. It will always remain," Environment Minister Prakash Javadekar told ClimateWire recently. And yet in a world where China is putting up $3.1 billion for climate change assistance -- comparable to the United States -- and even Mongolia is putting money toward the Green Climate Fund, the tables have already turned. The question now, activists say, is whether the Paris deal will be ambitious enough to avert dangerous levels of climate change. Leaders have acknowledged that in their quest to get all countries on board to cutting carbon, the Paris architecture has a built-in downside: Commitments are voluntary and based not on science but on what countries feel they can reasonably offer. The collective targets won't keep temperatures below the 2-degree-Celsius "guardrail," but diplomats say they hope the deal will create a strong system that encourages a routine ratcheting up of ambition. Hood, who is no longer part of the negotiations but is watching from afar, said he worries it's not enough. "If you have cancer and you know this cancer is going to kill you, you don't want to do a little chemotherapy once a month. You want surgery or radical chemo," he said. "I don't think there's a feeling of urgency."